An Abilene organization, that helps provide housing and counseling for children in need, is getting much needed support. 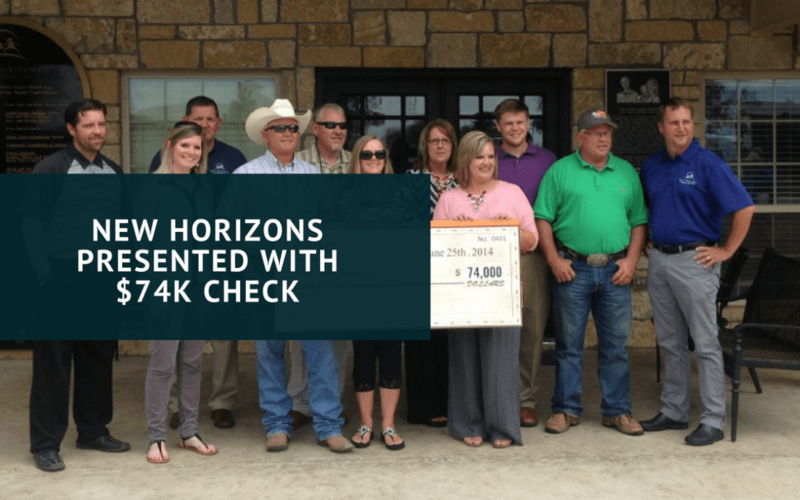 On Wednesday, a check was presented to New Horizons for $74,000 from the Bilbo Golf Classic. The amount raised from the event held early May was higher than the previous year, according to Communications and Grant Coordinator Hannah Wiginton. The organization has been in operation for more than 40 years. The money will help out operations in Abilene including the Audrey Grace House located on Medical Drive. “We have staff that are on-site 24/7, 7 days a week and we are basically considered the parents,” Michelle Perkins, the treatment director said. The Audrey Grace House is a residential treatment center that provides a therapeutic foster home to children ages five to seventeen years old. They are currently serving eight girls and fourteen boys. “We are always needing money because the price of children’s needs increases,” says Perkins. “No child needs a facility like this,” says Bandi Jones, whose family founded the Bilbo Golf Classic. “We would love to close down tomorrow, if all the children are well taken care of.” Bandi Jones has been working for organization in the past year. The Bilbo Golf Classic has supported New Horizons for five years, and have raised nearly a million dollars. With the Foster Care Redesign Program, kids are being kept closer to their homes, instead of being sent to cities across the state. “We are trying to get all those kids from the Abilene and surrounding areas back here,” says Perkins. “The need has increased because you do not realize how many children need a facility like Audrey Grace House.” Currently, space is comfortable, although the house is expanding. When the house was first built in 2009, it was budgeted for 20 kids. Nowadays, they are serving 22 and are planning to go up to 25. Hence, why the check is beneficial at this point. The money is used throughout all services, but at the Audrey Grace House, it will be split to help with therapy, doctor visits, and leisure activities. “Anything that any regular kid in their natural home setting need, that is what we are trying to provide,” Perkins adds. Jones hopes that one year, the Bilbo Golf Classic will raise $100,000.